The last day of school has come and gone. Monday Blues are now a thing of the past. See ya! For the first time in months I was able to sleep in this morning and function without a cup of coffee. Now that’s a miracle my friends and calls for celebration. I could get used to this. Is it possible to apply for a summer extension? Ten weeks just doesn’t suffice and I’m sure every kid out there would agree. Most families thrive on structured schedules full of activities and planned play dates to pass the time, but we’re more than willing to stray from the rules for some rest and relaxation. After all, that’s what the mini break is all about – soakin’ up the sunshine with a stress-free attitude. It might as well be the motto of the season! With the arrival of summertime comes frequent gatherings with friends and backyard BBQ parties by the pool. It’s the ideal opportunity to steal the show with side dishes no one expects to see at the table. 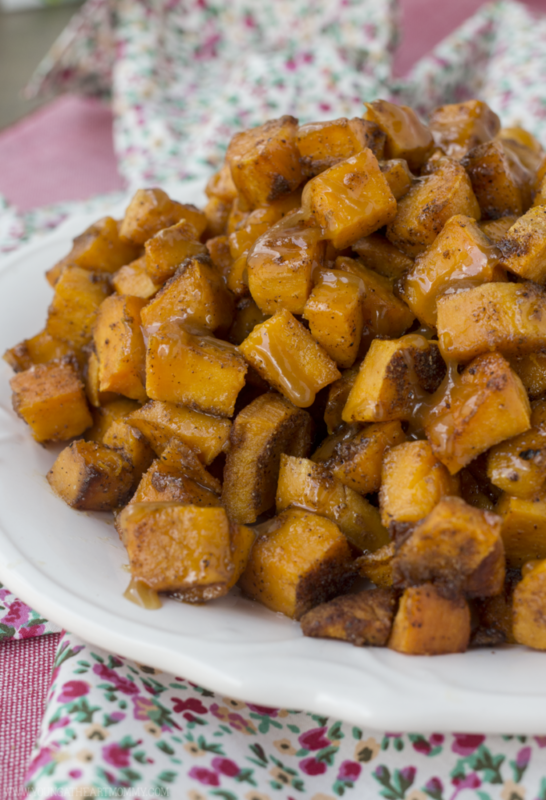 Cue this scrumptious sweet potato dish that has your name all over it. 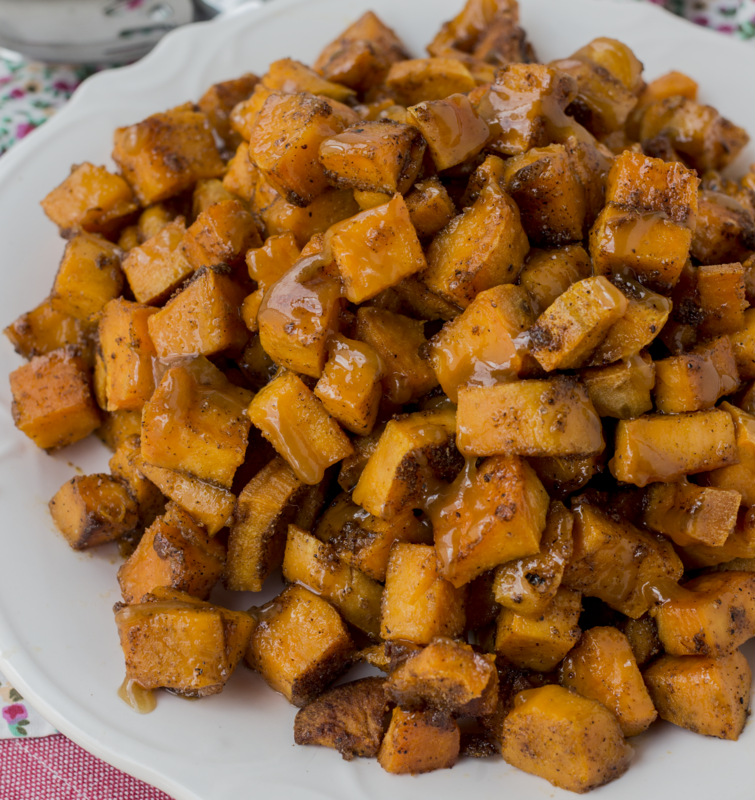 Sweet and Spicy Roasted Sweet Potatoes have become a favorite recipe in our home because they’re super tasty. Tossed in LouAna Coconut Oil and seasoned with spices, their natural sweetness shines through. 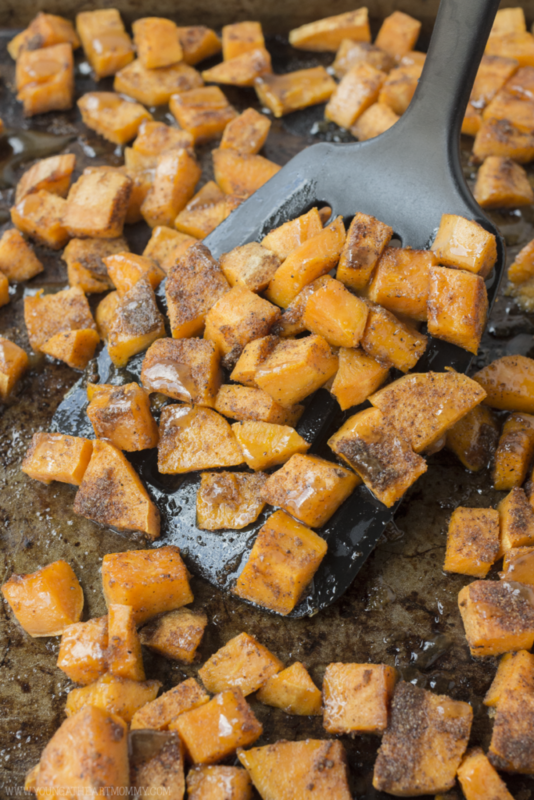 Sweet potatoes are no longer just a cold weather comfort food. In a small bowl combine an even amount of all spices, 1 tbsp. of each should be enough. 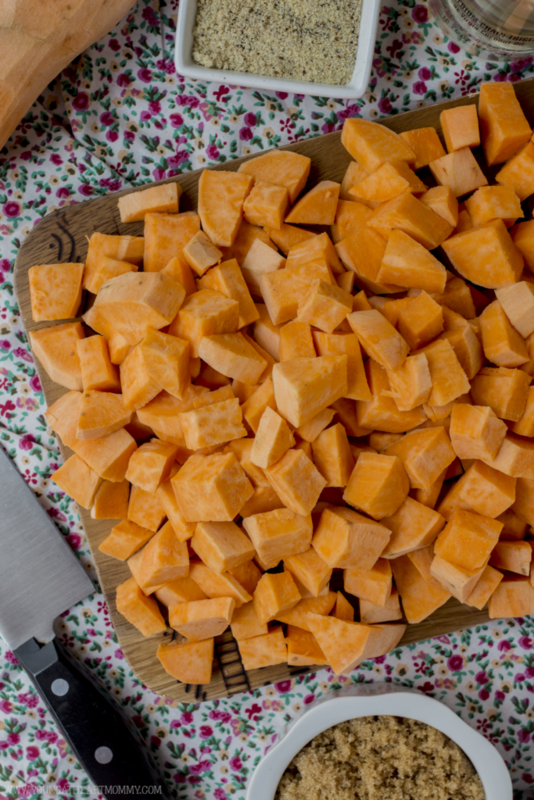 Peel sweet potatoes and dice into 1 inch cubes. 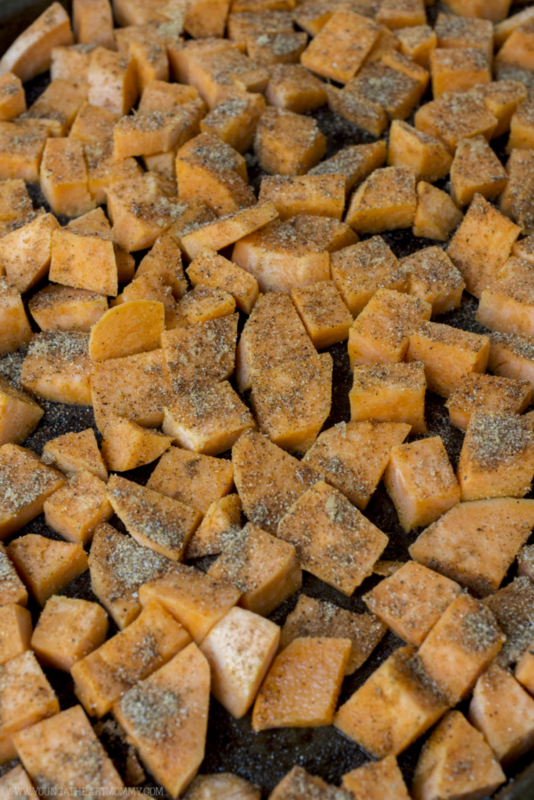 Line a baking sheet with sweet potatoes placed in a single layer. Drizzle on the coconut oil and use a spoon or spatula to move them around so they are coated evenly. Bake for 25-30 minutes or until potatoes are tender. Create the brown sugar glaze by combining light brown sugar, maple syrup, butter, and a tsp. of cinnamon in a small bowl. Mix and melt in the microwave for 2 minutes. You can also do this in a small saucepan. Drizzle glaze over potatoes and serve immediately. Simple, delicious, and incredibly addicting – the amount of zest in this dish is UNREAL. For the past four years I’ve been reaching for coconut oil to bake, cook, and transform everyday meals into delicacies. It makes a huge difference in the overall flavor, regardless of what you’re preparing. With over 14 different types of cooking oil, LouAna has the perfect oil for all of your cooking needs whether it’s sautéing, deep-frying or baking. The coconut oil helps create a crisp coating on the outside while the centers remain tender. A little sweet. A little salty. Each bite practically melts in your mouth. I’m so addicted to these! Can you blame me? You have to give them a try. For additional crunch, bake longer or set your oven to broil. Watch carefully because they will burn quickly if left for too long. Find even more tips and how-to’s when creating your food recipe or beauty recipe/tutorial here. LouAna coconut oil sells more coconut oil than any other brand! 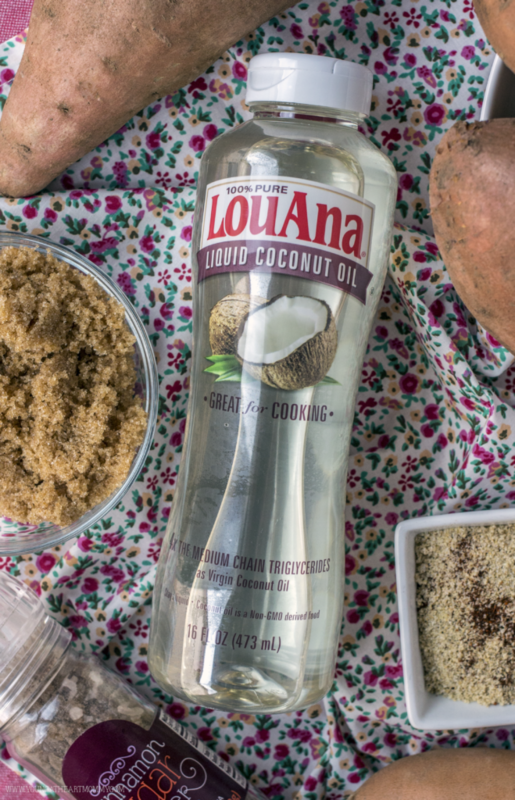 That’s because with over 120 years of producing some of the best cooking oils in the country, LouAna knows a thing or two about what makes a good coconut oil. It all starts with 100% pure coconut oil that allows the taste of your favorite foods to come through. Now it’s your turn! 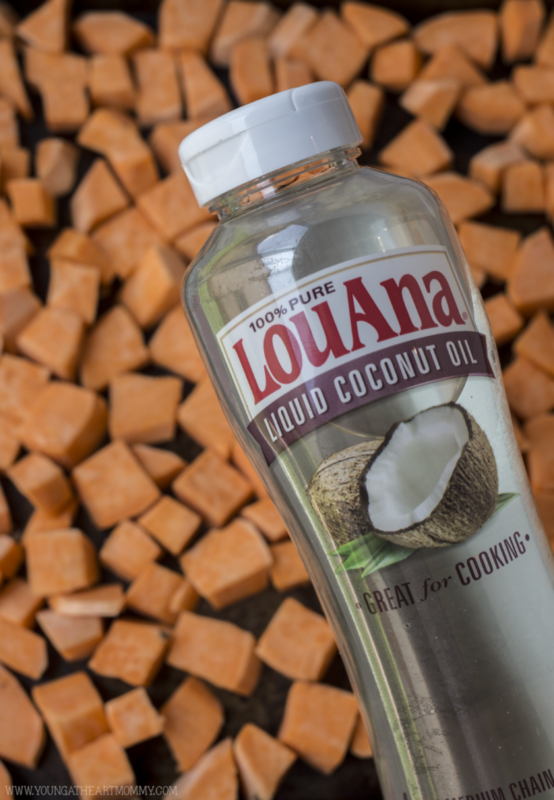 Grab the LouAna Liquid Coconut Oil and other ingredients needed to make Sweet & Spicy Roasted Sweet Potatoes at Publix. Keep an eye out for their new packaging, available in stores starting August 1st. What are you favorite summer side dishes? 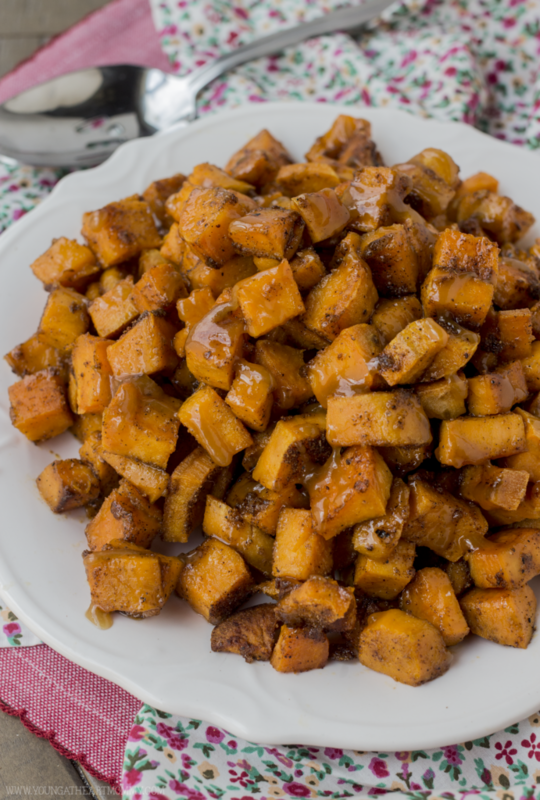 I love Sweet potatoes and this recipe is amazing and has a lot of flavor. I would love to make this dish for me and my husband.